Miriam Cain at Camper & Nicholsons sends news that Charles Ehrardt has signed the 26.5m motor yacht Sunkar for sale. Built by Aicon in 2007, she sleeps eight guests in four staterooms and twin 1825hp Caterpillar engines give her a cruising speed of 27 knots. 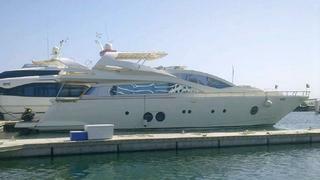 She is available to view at this week's Cannes Boat Show.